India’s mobile handset maker, Micromax is now targeting USB dongle and router market after private operators have launched 3G services. With innovative handsets it captured a good per cent of Indian handset market. Micromax already launched unlocked 2G, 3G, 1X and EVDO USB dongles. 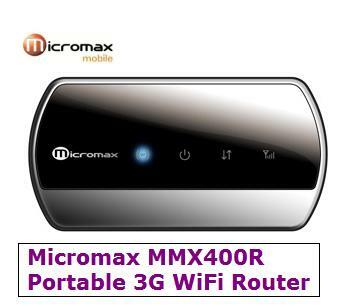 Similar to Olive Nexus router, TTSL’s Photon WiFi Router & Tata Docomo dual mode router and Vodafone’s MiFi, Micromax has launched portable wireless router MMX 400R. Micromax also launches a new 3G USB dongle 352G supporting HSDPA of 7.2Mbps and HSUPA of 5.76 Mbps.Both devices come unlocked so you can use any operators’ SIM card to access 3G/2G data services. The palm-fitted sleek, stylish and trendy Wifi device 400R supports up to 7.2Mbps download speed and 5.76 Mbps upload speed on HSPA network. This single device can offer internet to multiple devices up to a distance of 10 meters over Wifi. With it you can reate your Personal HotSpot and can access any of your Wi-Fi gadgets in your personal Hotspot be it a laptop, Wi-Fi mobile, Camera etc. whether CDMA network i.e MTS, TATA INDICOM, RELIENCE CDMA sim will support / function with this device?